EduFirst offers a FREE Diagnostic test to interested students who are keen to join us. 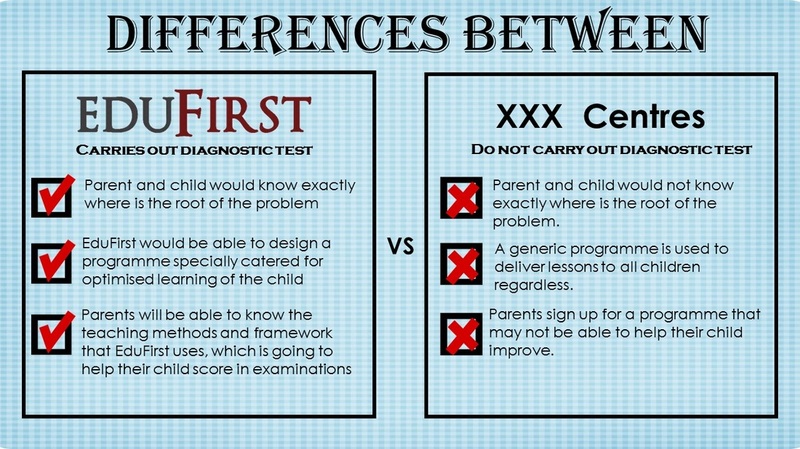 What to expect during the Diagnostic test? Your child will be sitting for a 40 minute test. Our tutor will be marking the paper to look out for the areas of weakness of the child. The tutor will also be analysing the past test papers and worksheets of your child to gauge his/her standards. What happens after the end of the test? Our tutors will give you a detailed analysis of your child's performance (areas of strengths and weaknesses), finding out your child's current roadblocks that are stopping him/her from breaking through to the next level. We will also find out your child's individual learning needs and to discover the different ways and methods that you/your child can adopt to seek improvement on their weak subjects. Where does your child stand in relation to the demands of the new PSLE/ English 'O' and 'N' Level syllabus? REGISTER FOR A FREE DIAGNOSTIC TEST TODAY!